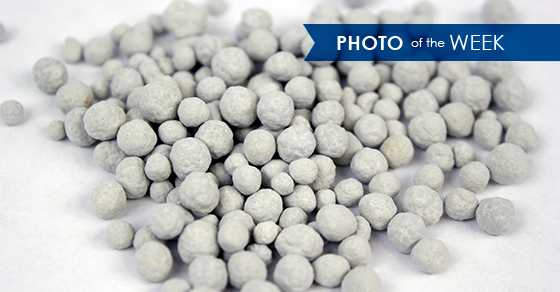 This week’s photo highlights fly ash pellets. FEECO’s familiarity with fly ash agglomeration dates back to 1951. For decades, we’ve manufactured custom processing equipment, be it for de-dusting applications, conditioning for landfill, or pelletizing the material for use in cement or soil amendment applications. FEECO offers disc pelletizers, pug mills, and pin mixers for your fly ash agglomeration needs, all custom designed and constructed. In addition to fly ash equipment, FEECO also offers material testing in our renowned Innovation Center. This unique facility is capable of testing material samples to confirm the feasibility of a new product or idea, to enhance the characteristics of the existing product, or to improve the process as a whole. The pellets in today’s featured photo were produced in the FEECO Innovation Center. When it comes to fly ash testing and agglomeration equipment, FEECO has you covered. To learn more about our capabilities in working with the material beyond agglomeration, visit our fly ash processing page, or contact us today!